Your local grocery store cereal aisle is hardly a war zone, but the battle of the big breakfast cereal brands -- General Mills versus Kellogg’s -- is heating up. It all started in January when Lucky Charms’ parent company released an unofficial mashup of the magically delicious cereal and rival Kellogg’s Frosted Flakes. Now, the latter company is hitting back with a pairing of their own to keep the feud alive. 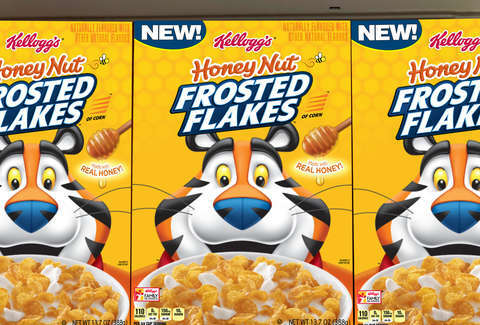 Earlier this week, the brand debuted Honey Nut Frosted Flakes, a blatant rip on General Mills’ iconic ‘O’-shaped cereal. The yellow, honeycomb patterned box features the Frosted Flakes logo, along with the cereal’s beloved mascot, Tony the Tiger. Above the logo are the words honey nut, along with a tiny bee -- neither of which is particularly reminiscent of that seen on the Cheerios box, but we see what they did there. Oh man, who loves a good ole’ fashioned cereal duel? Remember earlier this year when General Mills made Lucky Charms Frosted Flakes as a giant 🖕to Kellogg’s because Kellogg’s cannot trademark “Frosted Flakes”? Well, Kellogg’s is firing back and shooting their shot at Honey Nut Cheerios and new Honey Nut Frosted Flakes coming soon! Thanks to @kelloggsus and @kelloggsfrostedflakes for sending me a box! No details provided, but I’m expecting a late December or early January release for these. The cereal combines everything you love about the sweet Cheerios, with the crunchy, sugary deliciousness of Frosted Flakes. To create this tasty combo, Kellogg’s brought together honey, brown-butter notes, and a nutty flavor on top of their signature crispy corn flakes. General Mills hasn’t responded to Kellogg’s latest dig. Perhaps the two companies can get together over breakfast to work things out… or come up with new ideas for cereal mashups.